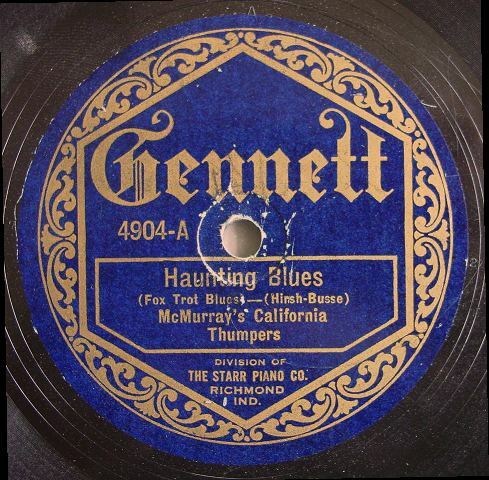 June 8th in Gennett History, 1922: McMurray’s California Thumpers recorded “Haunting Blues” in NYC. The recording appeared on Gennett 4904, Starr-Gennett 9260, and Rich-Tone 7045 (as the Dixie Boys). This recording featured Phil Napoleon & Jules Levy, Jr. (c), Miff Mole (tb), Loring McMurray (sax), Frank Signorelli (p), and John Cali (bjo). Video | This entry was posted in Gennett, June, Video and tagged Frank Signorelli, Gennett, Gennett 4904, Gennett Discography, Gennett History, Gennett Records, John Cali, Jr., Jules Levy, Jules Levy Jr., June, Loren McMurray, Loring McMurray, McMurray's California Thumpers, Miff Mole, Phil Napoleon, Rich-Tone 7045, Starr Gennett, Starr-Gennett 9260, Video. Bookmark the permalink.